...harnessed America's vast mineral resources and tapped its long-stored capital to create needed industrial growth but who, to turn that growth into personal wealth, had stationed themselves at the "narrows" of production, the key points of production and distribution, and exacted tribute from the nation. They were the men who had blackmailed state legislatures and city councils by threatening to build their railroad lines elsewhere unless they received tax exemptions, outright gifts of cash -- and land grants so vast that, by 1920, the elected representatives of America had turned over to the railroad barons an area the size of Texas. They were the men who had bribed and corrupted legislators -- the Standard Oil Company, one historian said, did everything possible to the Pennsylvania Legislature except refine it -- to let them loot the nation's oil and ore, the men who, building their empires on the toil of millions of immigrant laborers, had kept wages low, hours long, and had crushed the unions. Their creed was summed up in two quotes: Commodore Vanderbilt's "Law? What do I care for law? Hain't I got the power?" and J.P. Morgan's "I owe the public nothing." The passage above, lifted from Robert A. Caro, "The Power Broker: Robert Moses and the Fall of New York," which is an exceedingly old (published 1974) and exceedingly weighty tome (over a thousand pages! yikes) but compulsively readable and instructive about the practice of politics in 20th-century America. The Business Plot was the first organized attempt to overthrow our Democratic society. It failed thanks to the loyalty and integrity of General Smedly Butler. Unfortunately they just learned to be more subtle and purchase a president (Ronald Reagan) and media outlets (Fox) which allowed them to win after all. Brushfire, you have an interesting if inaccurate view of history. What's inaccurate about it? Heck no I don't support him. He opposed the war but that was the only smart thing he has done. Everything you said was inaccurate. It is only your mistaken opinion. Do yous till support Obama and his three wars? Anonymous - Um..Can you be more specific please? Perhaps a smidge of evidence? Or a concrete refutation of any specific thing I have said? I'll be glad to support my assertions if you so request. 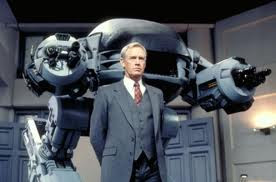 Love the Robocop picture, J.W. So is it true that OCP practically *is* the military? One of my all-time favorite films. Why do i need to give evidence about your opinion? They are your opinions. it is up to you to defend them. If you can, then I will address your proofs.